Cruise ships dock near the center of town. A pedestrian area extends for 5 blocks to the east, away from the port, and the ever-present hilltop serves as an excellent orientation marker. Distance to the town center is about one mile (1.5 km). Taxis can be found outside the port gate. Shuttle vans are available for the short transfer from the pier to the port exit. From there, the main square is within walking distance. Historically, Arica was an important trade center for products from the interior, and the Quechua and Aymara Indians still come to the city to sell traditional handicrafts. 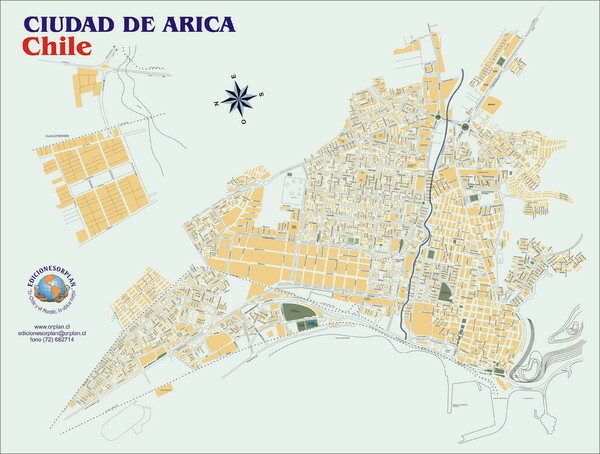 Arica is also a major transportation center, with international air links to Bolivia and Peru. Among adventure travelers, the city is best known as the starting point for excursions into the Atacama Desert. The Museo Arqueologicò San Miguel de Azapa, located a short distance out of town, gives an excellent introduction to the history of the area. Among its most fascinating exhibits is a collection of Incan mummies, whose bodies were perfectly preserved in the extraordinarily arid sands of the forbidding Atacama. North of downtown, the long Chinchorro beach will give you plenty of room for sunbathing, swimming, or in-season jet ski rental, and there are restaurants, cafes, parks, and an Olympic-size pool near the shore. Llama sweaters and musical instruments are popular items in Arica. There are several markets and artisan shops that sell a variety of handicrafts. The main shopping street is 21 de Mayo. Business and trade establishments in Chile are generally open to the public from Monday through Friday from 9 a.m. to 8 p.m., with a 60-minute lunch break at 1 p.m. Saturday timetable is 9 a.m. to 2 p.m. In malls, the timetable is Monday through Sunday from 10 a.m. to 9 p.m.